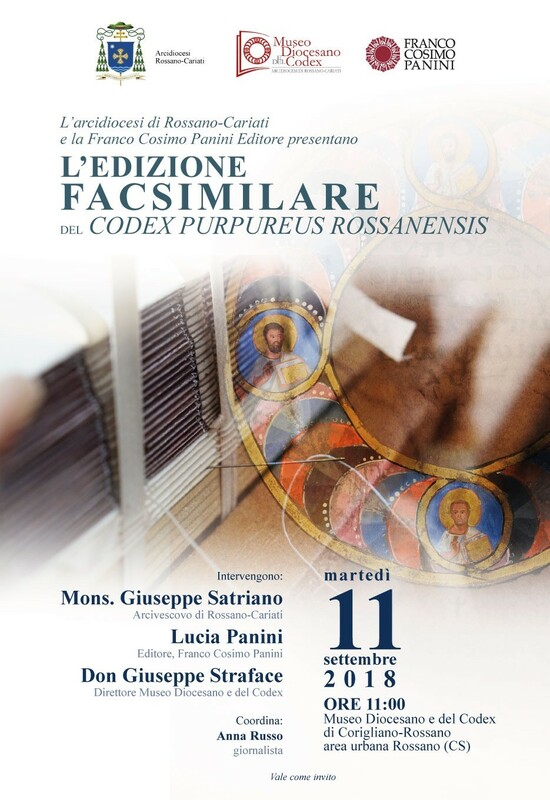 Domani, 11 settembre, verrà presentata l’edizione in facsimile del Codex Purpureus Rossanensis, realizzata da Franco Cosimo Panini Editore su incarico dell’Arcidiocesi di Rossano-Cariati. Un’occasione per conoscere il Codex e l’importante progetto scientifico e culturale che ha portato a questa nuova edizione in facsimile della casa editrice. Appuntamento alle 11 presso il Museo Diocesano e del Codex! The facsimile edition of the Codex Purpureus Rossanensis will be presented tomorrow, Sept. 11th. This edition was commissioned to Franco Cosimo Panini Editore by the Archdiocese of Rossano-Cariati. A unique occasion to discover the Codex and the important scientific and cultural project behind the new facsimile edition by the publishing house. We will be waiting for you all tomorrow in Rossano, Museo Diocesano e del Codex – 11:00 am. The Codex Purpureus Rossanensis, masterpiece of Byzantine illumination, was realized in the 6th century in a place not yet identified, but surely in the eastern area of the Mediterranean basin. Even though very ancient, the manuscript is extraordinarily well preserved: once brought to Rossano (between the 8th and the 10th century), the Codex has remained there, where it can still be seen today, one of the most precious illuminated Gospel books in the world.